Adovia's Purifying Mud Mask is made with pure Dead Sea Black Mud, Aloe Vera, Beeswax, Vitamin C & A, Ginseng, Olive Oil, Chamomile, and Jojoba Oil. It is a thick mud mask that comes in a squeeze tube. The tube makes the mud last longer than jars so that one tube used once a week can last 6 months to a year. It contains about 30 uses. To use the mask, you simply apply a thin layer of mud to your face, let dry for 15-20 minutes, and then rinse off. I love how this mask dries and feels like it's really pulling the toxins and dirt out of my pores. After rinsing off, my skin feels tight and firm, and my blackheads seem to be reduced which is a major plus. I have combination skin and this mask helps to exfoliate the dry flaky skin as well as pulling out the oil in my shiny areas, leaving my skin soft and smooth. 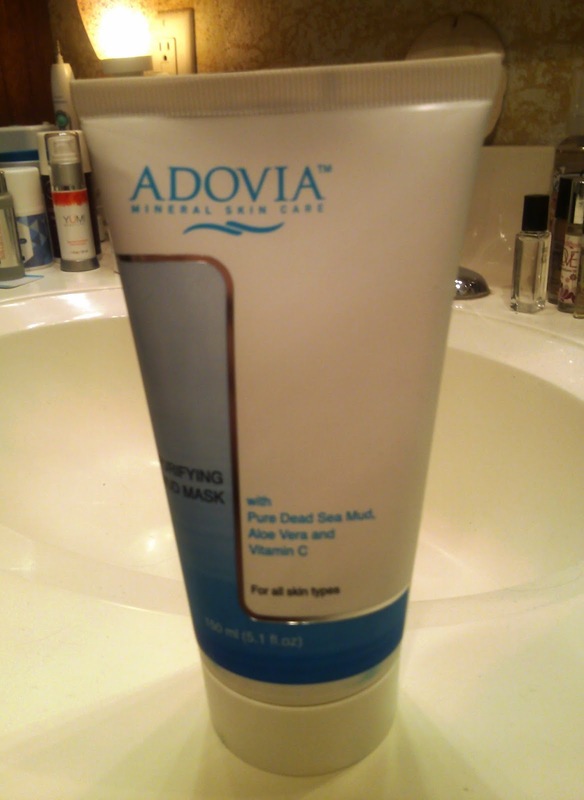 This Adovia mud mask is used in facial spas, so it's awesome to have a tube that lasts for a long time to use on my own without paying an arm and a leg for a facial. It definitely feels like it's spa-worthy and better than other mud masks I have tried. Plus it has all the minerals from the Dead Sea mud which naturally help heal skin and act as an acne treatment. I didn't even realize that this could be used as a spot treatment for blemishes or blackheads too. I'm very impressed with this product, and also enjoyed the Adovia mud bar soap I got free with my order.